Your editor-in-chief is Mark Meredith. Mark was a writer for Margaret Weis Production’s Marvel Heroic Roleplaying Game, contributing to the Civil War: 50 State Initiative and Civil War: X-Men supplements. Not only does he write here at Plot Points, he is also the editor-in-chief and writer of Dice Monkey, a roleplaying blog that covers a wider variety of topics than here. You can find Mark on Twitter at @MarkMeredith, as well as email at tincanrocketship [at] gmail [dot] com. Contributing Editor Andrew Gatlin is new to the blogging world. As in, this is the first blog he has written for that people actually read. He is a husband and father of two, who considers himself a well-rounded geek. He makes his home in the north-western reaches of Alabama, near the “sprawling metropolis” of Florence. You can find Andrew on Twitter at @andrew_gatlin, on Google+, or by email at gatlin[dot]andrew[at]gmail[dot]com. Senior Writer Felipe Mascarenhas comes from the savage Amazonian Jungles of Brazil. Being a major Marvel geek and RPG nerd he was astonished when those two passions came together with the release of Marvel Heroic Roleplaying. He is also an amateur game designer and podcasts every now and then (in Portuguese) at Terceira Terra. You can find Felipe on Twitter at @felipenerdcore or by e-mail at felipealm [at] gmail [dot] com. Senior Writer Seamus Corbett excels at one thing: chasing the hero up a tree and throwing rocks at him, turning the screw until the wood splits, or just making a bad situation worse. This gift has served him well as a GM for more than a few systems over the years, and he brings it now to Marvel Heroic Roleplaying and Plot Points. He is raising two boys in this great tradition, proud of the fact that his brood can name more heroes on the comic shop shelf than most others who can actually read. He also has been sighted as The Opportunist on RPGMusings. Seamus can be found on Twitter as @OppR2nist, and can be reached by email at sotp_seamus [at] yahoo [dot] com. Contributor Joshua Unruh is a novelist, blogger, and freelance writer. It took the death of Marvel Heroic to get him involved in the fan community, but he’s in it up to his eyeballs now. He’s been reading superhero comics for thirty years and a a tabletop roleplayer for twenty-five years. Despite nostalgic love for TSR Marvel, Marvel Heroic is the first superhero RPG that he’s enjoyed as a superhero game. You can find Josh on Twitter as @JoshuaUnruh, at his blog www.JoshuaUnruh.com or email him joshuaunruh [at] gmail [dot] com. Contributor Ken Hart once interviewed a Doctor (Who, that is) for Marvel, promoted D&D clerical heresy in Dragon Magazine, and put a leather jacket on Anubis in the cyberpunk anthology Foreshadows: The Ghosts of Zero. He also wishes Frank Brunner had drawn more than two issues of Howard the Duck. He is the proud father of a brilliant nerd girl, Power Rangers fan and budding Marvel Heroic player. Ken can be found on the Brains of Morbius blog and on Twitter as @KenofGhastria, and emailed at ken[dot]hart[dot]dragonmech [at] gmail [dot] com. Contributor Joe Stroup discovered comic books as a kid and once he started the X-men series he has never been the same. He’s been into RPGs since college (mostly D&D) and when Marvel Heroic came out (right around the time the Marvel movies starting getting really good) he was immediately in love. He played in StephenChast’s online Age of Apocalypse game and loves introducing new people to RPGs. Joe can be found musing about the role of faith and games at the Raise Dead blog and on Twitter as @JoeStroup, and emailed at joseph [dot] stroup [at] gmail [dot] com. Contributor David White was raised on Batman: The Animated Series and the old X-Men cartoon of the 90’s. As such, he is quite nerdy and grew up with a love for comic books and the heroes therein. David started playing DnD 3.5 in High School and found he loved that as well. When he saw a roleplaying game featuring his favorite Marvel heroes, he bought it STAT! David hopes you will help keep this great game alive at your table. Follow David at his blog: Same Kind of Nerdy As Me or at Facebook or Twitter @MrBananaSocks. David also produces an actual-play City of Mist podcast. David can be emailed at dbw08a [at] acu [dot] edu. Contributor Jayson Jolin began his superhero role-playing experience with TSR’s Marvel Super Heroes, and has done a fan rewrite of the game with a twist of Fate added in he calls Marvel Nth Edition. Although he only has D6 Drawing Specialty he still enjoys that hobby, particularly when he can pair it with his gaming. He’s done fan cards for use with The Good, The Bad, And The Munchkin, and a TSR Marvel RPG-inspired Universal Table for use with Marvel Heroic. He is a husband and father. His favorite comic is Atomic Robo. You can find Jayson on Twitter at @realityjaysonjay and at his own site https://sites.google.com/site/fanfictionandgames/. His email is jpjolin [at] gmail [dot] com. You can find Michael on Twitter at @Gamemasterscmx and at his own site https://omegaforceblog.wordpress.com/. His email is michaeldismuke1 [at] gmail [dot] com. How would you feel to me contributing content to your site, if I make some? I would absolutely love to do so. Drop me an email and we can talk details. Could I request a datafile for Nightcrawler? I have a player who really wants to play him, but can’t find him anywhere and no time to do it myself. There should be something relevant to your interests in the next day or so. Awesome Blog! Amazing Data files! Keep up the good work. Any chance of Deadpool data file in the future. Great work all around, and keep it up. We are organizing all the requests. I can’t promise anything, but we try to please everybody. Hi, I’m still trying to get my head round the system, but would like to see DataFiles for personalities like Aunt May and Mary-Jane and – at the other end of the spectrum – Galactus and The Dark Phoenix. Keep up the great work! One of the strengths of the system is that characters like Aunt May and MJ don’t really need datafiles. They’re as much scenery as anything else. That way, you never have to worry about untimely deaths for important Watcher characters, unless it’s key to the plot. Do we need to know how well Aunt May can fire an automatic rifle? Not really. Now, if there were a Scene where Aunt May were in an apple pie bake-off with the heroes things might be different. I have a feeling scenarios like that will be rare. How can I support the site as a watcher? Im attempting to organize a game in my hometown but players are scarce and comic/game shops are cold-lukewarm on the idea because they know how few gamers there are. They are willing to host playspace for the game but nobody wants to give dicounts for dice or anything. Maybe building this site will provide a place to refer would-be-heroes. Referring new players to the site would definitely help. In addition, we’ve just recorded a session, and should have it up on the site within a few weeks. This should give new players an idea of how the game plays. Oh thats awesome! do you have a link for this yet by chance? Like to see Mimic and some Exile data sheets and Secret Warriors since you already have Nick Fury and Daisy. Have you thought about the Ultimate Universe any? You clearly have the most aesthetically pleasing character sheets. How about sharing a blank for those of us playing custom characters? We don’t have any plans to do him. But, I imagine he will be in the Annihilation book when it comes out. Hi. I am an avid player of marvel TSR’s game. I have been running a campaign for 20 years. ( by the way…not a loser…married professional with 6 pack). My original players still rock our online campaign. But after reading the game book…we are converting our game this month. Best mechanics I have seen ever!!! Hey, I want to help make character sheets. Even more so, I want to know who to chat with about reviewing my campaigns and me writing storylines. (I’m a paid writer/public speaker) but would love to do something Marvelous. I do pro bono to prove I got the chops all the time. I’m all for pro bono. I do it anyways. Might as well let other people enjoy the games I put together. I can even send you references. Let me know what email to send my ideas to and what exactly you are looking for. I can whip out character cards for all kinds of characters. And I love making storylines. You sound like a writer after my own groove. You can send the email to Mark (tincanrocketship [at] gmail dot com) and copy me (gatlin[dot]andrew[at]gmail[dot]com). We’re pretty much looking for a little of everything. We did. We’ll get back with you when we can. Great. I am in eager expectation. Me and my friends spent last week playing the game. Amazing is all I can say. Actually, I can say Class 5000!!!! We are loving it and, for the first time in 18 years, my friend is playing the Watcher. That means I get to play! He whipped together a fun game for 5 people in 30 minutes that fit into our current storyline. Gone the days of complicated campaign building. The Margaret Weiss team nailed it. We are hooked. Good thing you didn’t call the game Monstrous (75). Yeah, sorry dude. I will try to get those to you this evening. If you want to contribute, shoot me another email with some ideas and we can talk. Hi! I’m trying to create a template for Eric O’Grady’s Ant Man – not sure yet if it’ll be universal or if I’ll make three versions – his time at the Initative where he’s still a rookie, as one of Norman Osborn’s covert Thunderbolts and a third as one of Steve Rogers/Clint Barton’s Secret Avengers. Would you be interested in having that info to turn into a Character Template? I might also try making one or two more for other heroes or villains I’m fond of. I’d be interested in seeing them for sure. 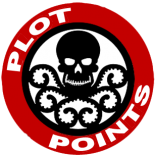 I had an idea, I’m not sure if you guys have time to start it up, but what about a Plot Points Forum? That way there is a place for Plot Point Fans and Marvel Heroics Fans in general can talk about Marvel Heroics, drop their own custom Events, Campaigns, Datafiles, ect. and you guys could see/use some of those ideas in future Plot Point articles. Hiya. Looking over the comments I agree a Forum would be amazing. I have so much questions but i’m not sure how to go about it. I live in Arkansas and believe it or not I have a rather sizable following for this game. I’ve been “the watcher” for about…2 years now. i don’t know it seems that long. We have about 14ish members with some guest every now and then. That many people to manage is no picnic believe me. We’ve done a total of Two Marvel Campaigns and are now working on a Gotham City based rp where the players can play villains/heroes and oppose eachother. We gather once a week on average and has this out. I would love to talk to some of you with more experience with this game to give me advice maybe. Some of the game play mechanics I’ve always been uneasy about and would love some advice about role playing the characters in general. If you have the time that would be great. Can I get a copy of the datafile template you use please? My email address is jonathan.baldridge [AT]gmail.com. Would you all PLEASE consider doing tons of writeups for DC heroes and villains too? I would love the data file template too. I’ve been judging a Marvel campaign for over 20 years. I have been Watcher for 2. Hey i have an idea for Milestones for Taskmaster if played as a reluctant hero. I would love to get opinions on them. Nobody, even yourself can pin down exactly where you stand in the grander conflicts between good and evil. Its time to make up your mind. 1xp: When you make use of a Complication caused by the Doom Pool. 3xp: When you first Buddy or Team with a hero that has formerly declared you a villain. 10xp: When you either decide to dedicate yourself to this heroic path or ditch it and go back to freelance villainy. Every time you use your power you lose a little bit of your self. Who are you and what have you lost? 1xp: When you mention training somebody and use that person´s moves against an enemy. 3xp: When you suffer Mental Stress from a failed Mimic roll. 10xp: When you either forget someone you care about or regain memories of someone you have lost. First time poster and non-English speaker. I think those look great. Really solid milestones. The Dual Nature one might even be used for other villains that are turned to the light. Songbird has a similar one i think that i saw after posting this. Hey there! I was a big fan of MRPG back in the 80s when all my friends were DnD and other adventure buffs. So I got excited about MHRP and the awards it received. I was able to get some initial copies while funds were low and when I had the cash – sadly all went out of print and licensing. There was brief hope with an Amazon purchase but after a few months they wrote and said sorry no copy available. Glad to see this site and I know its a lot of work but was wondering if this site could be like the ones dedicated to the old MRPG? All the files are there, books, modules, profiles…any chance a fan base here can collaborate and get all the books online? Beautiful site, great material here! I have a player who is interested in playing Scarlet Spider, your datafile for him is perfect. I’m really new to the game, so I’m finding a lot of your explanatory pieces useful. Tangentially, I am getting a kick out of the All New X-Factor run, I was curious if there are datafiles out there for that group. The only Polaris datafile I’ve been able to find anywhere is in the X-Cutioner’s Song event, and that’s a very 90’s version of her. I’m having trouble finding Cypher, Warlock, and Danger too, if they are out there. I am running a game for the first time this weekend, so wish me luck. It’s going to be the Civil War event, with a bunch of guys who know comics a lot better than I do. Thanks again for great material! I found and started running game not too long ago. I was saddened to have seen it end, but your site breathes extended life into it and give me fuel for my multiple games. So, thanks! Quick question though: How would you do Dragon Ball Z (You’ve probably been asked this a lot)? I have some anime fans in my group and I’d like to give them something. Can you create a data file for The Collector, Infinity Gems/Gauntlet, or maybe even the Power Cosmic? I just read this, like, a couple days ago. Never knew you guys were part of the actual MHR team! Awesome! Are all of these emails still accurate? I sent two of you a fantomex file. Also in the rules (in the basic book) it talks about building the doom pool by grandstanding. how does that work? How about datafiles for the Inhuman Royal Family? Excellent choice! Given how important the Inhumans are shaping up to be in the new Marvel U, we’ll definitely work on them! Hey guys, just wanted to say thank you so much for doing awesome work on this site. It’s so cool to see the continued support for this game from fan sites like this. Thank you so much! Thank YOU, Danny! We hope you continue to enjoy what we put out. Any chance of the character datafiles for the 1602 Universe? Thanks to all who do this- this is super helpful and adds a lot to our game! I fell for this game a few years ago and just ran a 5 hour, 6 person intro game Origins Game Fair. The players left with some good reviews. I want to pass on the one page reference I made to this community. How would I do that? Shoot us an email, and we’ll get it shared. We’ll be sure to credit you. I just ran MHR at Origins Game Fair last week to great success. I even ran into Cam Banks in the vendor hall and said ‘thanks’ for all the work he put in to make a great game. I made some player aids that I would like to share. How could I get those to you to post? My group is 22 stories into our campaign. I design cover art and make short novels of each story (well-written; I’m a writer with comics on comiXology. Search Gamemasters Dismuke). I would be happy to post my data files. Do you have a preferred format? Would you like to post the adventures of my team or have a link to them? We have some great ideas on how to play from afar. We use WhatsApp and some House rules that make play fast-moving and engaging. I thoroughly enjoy this website, it has relit my enthusiasm for role playing, especially as I used to spend many a lost day with my friends and snacks playing the old TSR FASERIP Marvel edition. I have managed to track down most of the existing Sourcebooks in PDF format. Would you consider putting these in a link for others to download? Or would there be a copyright issue? Let me know, and I can get these over to you. Also, have you considered displaying other players characters, that they have created? Something like a Guest Star section? Me and my fellow players have all created original heroes, to fit into the Marvel Earth 616 era. Again, if you are interested, I could send you over the London Calling team? Any chance of you considering a “Guest Star Spot” for other gamers to submit their original characters? Much like the way you introduced us to Moral Man? I’m a huge fan of the MCU, but some of your SFX and Limits are not written the same per character. I would suggest a little more proofreading, before posting. I’ve loved this site, since the beginning by the way. You guys are amazing. Can you please do some DC files as well? You could maybe house them in a separate part of the site. I’d love to see writeups for DC heroes and villains. Batman, Superman, Shazam, Wonder Woman, etc. Why does your MCU writeup of the Hulk not have him getting stronger and stronger as he becomes more enraged?